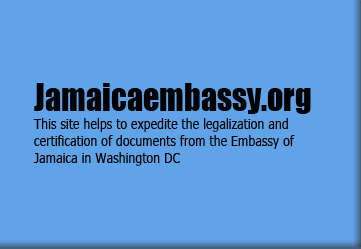 The contents of jamaicaembassy.us World Wide Web pages are Copyright © jamaicaembassy.us. Any rights not expressly granted herein are reserved. 1. You will not reproduce, transfer, distribute or store of part or all of the contents in any form without the prior written permission of jamaicaembassy.us is prohibited except in accordance with the following terms. 3. You may use jamaicaembassy.us World Wide Web pages on your computer or printing copies of extracts from these pages for your personal use as the use of this site and the content therein, is permitted to private, non-commercial use and not for redistribution unless consented to in writing by jamaicaembassy.us. 1. You will not provide any false personal information on jamaicaembassy.us, or order a service for anyone other than yourself without permission. 3. When you confirm a transaction on jamaicaembassy.us, you agree to be bound by and pay for that transaction. 5. If, for any reason you found that jamaicaembassy.us should refund your money back please, contact us and after we agree on refunding your money back please be notified that 10% of the total amount will be deducted. 4. All of the commitments you make in the jamaicaembassy.us Statement of Rights and Responsibilities apply to payments through jamaicaembassy.us. In the event of any conflict between these Payments Terms and the jamaicaembassy.us Statement of Rights and Responsibilities, the Payments Terms shall prevail. jamaicaembassy.us is a registered trademark of jamaicaembassy.us Corporation. Copyright © jamaicaembassy.us Corporation 2002. All rights reserved.